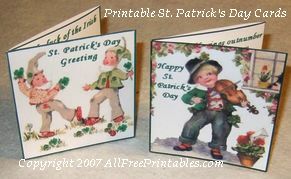 Vintage fine art prints adorn these two free printable St. Patrick's Day cards. Both cards print on one piece of card stock - and we even supply a free printable envelope to fit the cards! May the luck of the Irish always be yours! Click on the thumbnail photo at left to open the full-sized greeting cards image. As you can see the cards are a three-fold design. 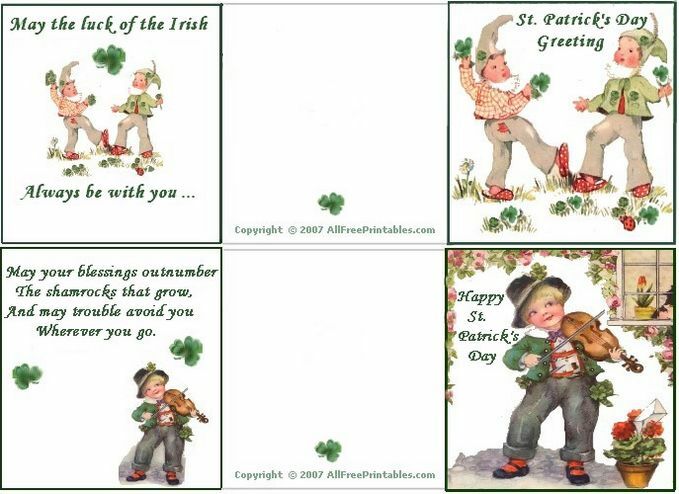 The image on the left folds to the inside to give you a fully illustrated card with a St. Patrick's Day greeting on the front, and a matching illustration and sentiment on the inside. If you prefer, you can choose to use the cards as a two-fold design, cutting off the third section, so that when you fold the card in two, the inside will be blank. Use the third piece as a bookmark or small notecard to give to someone else. Printing on plain, white card stock is recommended, although a good brand of computer paper will also work, especially if you are using the three-fold design. Print Preview: Portrait or Landscape Printing? Use the print preview feature on your computer to see if the cards will fit your normal page set up. The card image may work fine in the default "portrait" mode, but if your printer margins do not allow this, simply select "landscape" mode in your printer page setup so that the cards will print sideways on the page. Cut out both cards, being careful to cut just outside the green border lines. If you are using the three-fold design, fold the left third of the card into the inside, then fold the front over the top, lining up all the sides with care. 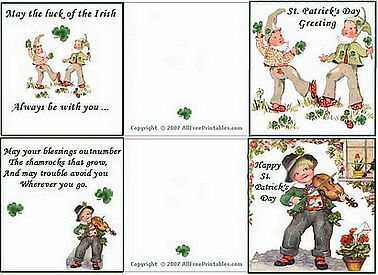 For the two-fold design, cut off the last third of the cards, then fold the remaining two sections in half to form a St. Patrick's card with an illustrated front that is blank inside. Print and cut out the free printable envelope. Prefold the side tabs to the inside, then fold the back section up, and the closure tab over top. Reopen the back and apply a small amount of glue to the side tabs. Fold the back up again and press firmly against the glued side tabs. Allow glue on the envelope to dry, then insert card and glue down the top closure tab.